Akshara closed her eyes before taking a deep breath in . The tantalising freshness of the early morning air revived her senses . She , with utmost dedication , continued with her Pranayama even though the chilling arms of the breeze was bruising her delicate skin . Opening her eyes , she gazed at the supple stretch of green land which lay ahead of her . It has been a month now since she has been following this routine . Never a moment did she find it a tad bit monotonous . The atmosphere was amazingly silent ; not a pitch higher could be heard anywhere . Yet, in that solitude she found herself conversing with her inner self the most . She was feeling better ,which was something she hasnt felt for a long time now . Yes , Silence is a great healer . ” Now you may retreat back to your room and take a bath . Breakfast will be ready in half an hour . Will meet you all downstairs . After which you would join for your physical rehabilitation session with Dr . Ankita . ” The Yoga instructor conveyed in his usual mellow tone. Akshara pulled herself up with much difficulty . The Yoga instructor walked to her . ” Good to hear that dear . Relax for a bit now . We will start the next session after breakfast “. Akshara strolled back slowly to her room . As usual , her fingers grazed the flowers that stood garnering the window sills on the corridor . She leaned forward to kiss a rose bud which was starting to blossom . This was her most favourite place of the whole institution . There is something lively about the way the flower blooms . She harked back those days when she , along with her father, would go on teasing her Ma for toiling for hours in their garden. She would utter seemingly confused , ” Ma, arent flowers lifeless ? Why bother taking care of them when you could cook me one of those sweet dishes of your’s ?. I am hungry ! “. To which her mother would reply patiently , ” Nature heals the best Aksha . I wont blame you for speaking nonsensical . The fault lies in the virtual world the present generation sinks in ” . Her father would sprinkle more oil into the flame with his usual remark , ” Aksha , it seems that your Ma loves you a tad bit lesser than those Orchids ” . She would put up a scorn while her father pretended to suppress his bout of chuckle . How their silly fights would go on and on . Now , ten years down the lane , she herself was the mother of a one year old . A single mother . Somehow the bitter memories of the past year came flooding just at the thought of her family . That unfortunate day she lost her husband on their journey to Manu’s wedding , the shattering moment she woke up from her deep slumber to realise that her life has changed for the worst , the struggles of her mind to adjust to the truth that she couldnot feel her baby’s skin against her fingers , the nights she lay crying in muffled screams when the memories of her husband, once the best part of her life now transformed into nightmares . The past one month felt like a fresh life to her . She was slowly gaining back the sense of her fingers, though the rehabilitation sessions were tough . Her hand would ache, like a million pins were being drilled through her skin . Yet she found color and joy here . More than that she was learning to come to terms with the fact that her Kiran is never ever going to wake her up with a kiss every morning . Fumbling with the door knob for a while , she walked into her room . She looked with longiness at the beautiful face smiling at her from the photograph . Amidst all these , there was one thing that kept her going , pushing her forward fighting all hurdles and heartaches . Her baby . For her , she needs to be back , she knew . 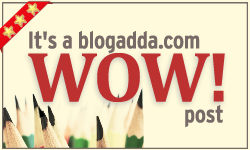 This post is a part of Write Over The Weekend initiative by Blogadda . The topic for this weekend is ‘ Silence Is A Great Healer ‘ . Interesting perspective to silent fights.. Thanks for dropping by 🙂 hope you liked it . .
Lovely !! Maliny you really took the virtue of silence to a new level. Cute story, I loved the way it mould out 🙂 Thanks, keep writing. Take care! Lovely tale ! So emotive ! i liked the way you dragged the characters throughout, it was like reading a novel. Maliny.. that was something.. very emotional.. in silent ways.. that is just great writing..
Hi, Maliny Nice blog… and very helpful content in your blog. Good work keep it up. Very good, I love to read this type posts! !